The Sonoma Humane Society’s mission is to ensure that every animal receives protection, compassion, love and care. To achieve this, SHS must continue to reach out to the community it serves proactively and inform the public of how they can help support the organization. SHS hired Circlepoint to help conceive and implement a strategic and targeted communication effort. Based on the Sonoma Humane Society’s goals, Circlepoint developed a communications plan identifying the most effective tools and resources to promote the organization and its offerings and facilitated a series of meetings with the organization’s leadership to develop targeted messaging. Through this effort, the organization’s communications have cohesion and clarity, helping to make SHS a more successful and effective organization. To support the organization’s fundraising efforts, Circlepoint developed and designed a fundraising toolkit. This important communications package features fundraising event suggestions and guidelines, a fact sheet, talking points, invitation templates, and a sign-in sheet. 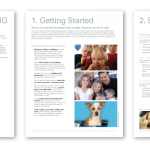 Most recently, Circlepoint worked with the SHS to develop a communication outreach strategy and set of activities as SHS successfully took over operations of the former Healdsburg Animal Shelter. 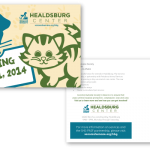 The strategy for announcing this new SHS branch, now named the Healdsburg Center, included a communications plan, branding, messaging; a style guide, direct mail postcard, signage, and media relations support. Circlepoint continues to provide ongoing communications and creative services to SHS.